The cooling Blender machine is U shaped sturdy container body, having top cover, bottom discharge valve, and longitudinal central shaft on which Spiral ribbons are mounted, having separate cooling system . Our specially designed spiral ribbons gives the best blending results due to Three dimensional action. i.e. The outer ribbons, pushes the material towards centre and inner ribbons pushes the material towards ends, and at the same time both the ribbons gives circulatory motion to the material. Thus every particle comes equally in contact with cooling zone. The cooling Blender machines are available with options as per customer requirements, having Full Stainless Steel construction, OR with contact parts in Stainless Steel and Non contact parts in Mild Steel with Enamel / Epoxy paint. Improves the consistent quality Homogenous cooling of the product. Improves Hygienic condition – Minimum hand contamination, avoids dusting of Material, all contact parts made of Stainless Steel, no need to go for natural cooling of the product. Add small amount of Powders – Colours, Concentrates etc. Add small amount of Liquids – Essences etc. with Spraying System. Break lumps & agglomerates formed during Mixing, while adding Liquids by Lump cutter system. 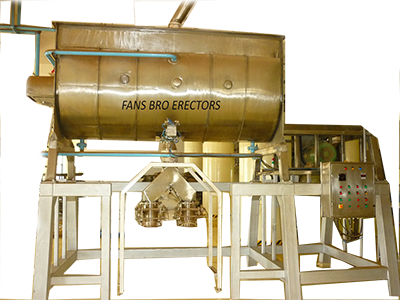 HOME ABOUT US PRODUCTS VIDEO ENQUIRY SITE MAP CONTACT US © 2013 Fans Bro Erectors All Rights Reserved.